This was held as usual at the Ellerslie Racecourse in Auckland. We were at the rear of the grounds next to the turnstiles the opposite side to usual, next to the fence. As it started to rain we switched our site to across the street under the trees. It was next to an entrance turnstile and we could shelter under the roof. 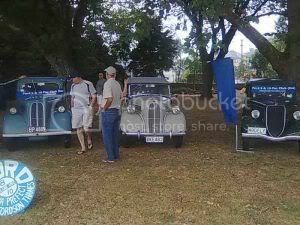 The members that came with cars were Dennis (46 Ford), Steven (49 Prefect), John brought his Anglia Tourer, Chris (37Y), and Bud and Thelma (1950 Prefect). Paul and Delia and Ant and Karen also came along without their cars so we had quite a good showing. There were some very nice displays the Mercedes Benz group had huge bunches of red roses and ribbon like material on their bonnets as the theme was Valentines Day. The Triumph Stag also had a Valentines Day display. The crowd did not appear to be as large as usual but we had some interested people looking at our cars and I think some new contacts were made. They had the usual event of cars competing against each other in a cordoned off area to see who was the fastest around an identical course. One of the cars came to grief, didn't stop when he should have. Most of our cars were gone by about 3pm.